Submersible halogen 3 light set with outdoor transformer for gardens, ponds, and fountains. Three sets of thick glass color lenses: green, blue, red, clear (color lenses not shown in photo). For use in and out of water. Transformer has mounting holes in four corners. Power cord to transformer 6', cable from transformer to connector 6.5', from connector to each light 16'. For underwater lighting, includes weighted light bases; and for garden lighting, includes stakes. Lights swivel up and down. 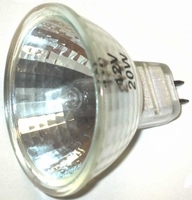 Halogen bulb is a MR16 20 watt (20W), 12 volt, replacement MR8017C or MR8017PC. Manufacturer warranty one year. Bulk item. Replacement MR16 halogen 20W (watt) 12V (volt) bulb for studio, track lighting, pond, water garden, garden flood lighting. With cover glass, 36 degree wide angle flood bulb (FL, FL-36), bi-pin base types: GU5.3, GX5.3. This cover glass version is UV (ultraviolet) block/filter/protected. Measures 2 inches across reflector diameter. Average bulb life 2000 hours. Actual bulb mounted into the MR16 shape dichroic reflector is: 20 watt, 12 volt, JC type, clear quartz glass, tungsten filament, color temperature 2800K.